The studio that can mostly do no wrong! PIXAR! We all know it. We all love it. And we all notice the little Easter Eggs hidden throughout every movie. The Pizza Planet truck. The ball with a star on it. Recurring background characters. We all thought these were just clever in-jokes by Pixar's animators, right? Wrong! Maybe they're not in-jokes. Maybe all these recurring things pop up because every Pixar movie takes place within the same collective universe! Don't question it! Just follow me. Here we go, listing the films in the chronological order that they happen! 1. Brave. The witch clearly has some magical power that lets her see into the future. That's why she has a wood carving of the Pizza Planet truck and a wooden plaque of Sully from Monster's Inc. Ok, moving on. 2. The Incredibles. Set sometime in the 20th century. Judging from the car models and styles of everything, I would say sometime in the 70's or 80's. Pizza Planet also hasn't been created yet. 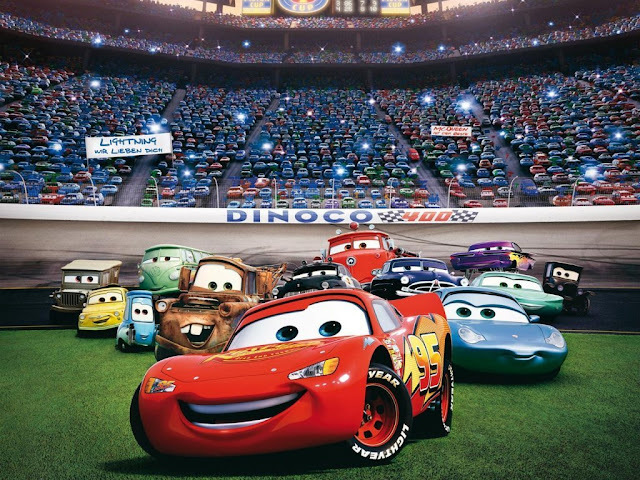 This is also the only Pixar movie without the truck we all know and love. 3-10. Toy Story 1,2, and 3, Bug's Life, Monsters Inc., Finding Nemo, Ratatouille, and Up all take place around the same time period. Buzz chops Heimlich (the caterpillar from Bug's Life) off a branch in Toy Story 2. Randall from Monsters Inc. ends up at the trailer that is also the home of Bug City in Bug's Life. There are many other examples, but you can see how these films are intertwined. Here's where we take a dark turn. 11. Wall-E. Humans have wasted the Earth and it's time to move on. We employ a whole host of very advanced robots to serve us and clean up our mess here on Earth while we're gone. After 700-something years in space, we humans have become fat, worthless blobs. And the robots seem to have gotten smarter. According to the ship's computer, they also have a complete history and memory of past life on earth. At the end of the movie, the humans come back to Earth and seem to be thriving. And now a darker turn. This hasn't been shown in any Pixar movie, but countless other movies have shown us that when we start to rely on robots, they realize that they don't need us anymore. Sometime after the events of Wall-E, the robots turn on the humans and eradicate every last one of us. Which brings us to the final two movies. 12. Cars 1 and 2. After the robots take out the human race, they try to start over and carry on the human way of life, but without us. They use the Axiom's memory from Wall-E and rebuild to the way things were. They build themselves into cars and planes, start cities, build freeways. Everything in life we had. Except our existence. And the robots, who are now cars, flourish. And that's why secretly a lot of people found the Cars movies to be creepy and soulless.